The last few days have been very relaxing. I have been spending loads of time with my mom who is visiting from Bahrain (middle east). The timing of the visit couldn't have been more perfectly planned. I just finished a competition and it will be a couple months till the next big one, so I have time to do some serious bonding. Physically I have had a strange couple of weeks that has made training difficult. First it was my ear and the whole cauliflower thing, finally that is okay now to train with just so long as I have on head gear. Then it was my hand, I climbed a long rope at the club to the ceiling but when I got to the top, I tried to reach up for the cement pillar (I don't know why, probably to show off) and slipped my grip and slid all the way to the ground while I was gripping the rope with my hands. They both got rope burn pretty bad but finally are heeling up. And lastly and by far the worst was I got some bladder issue. Prescription drugs are great. That's about all I want to say about that. my runs will last longer. It felt good to exercise after taking the time off for all the above issues. 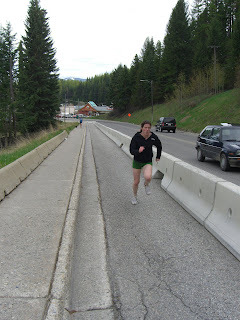 Tomorrow morning I am going to do some hill sprints with my training partner Dan. I always feel so great when their done.